Traditional sweets are usually prepared during festive occasions in our home and its been a while since I made any Indian sweet at home. I have been craving Rasmalai since quite some time but did not get myself to make a visit to our neighborhood Indian sweet store. Today, when Nehal asked me for ‘Rasgullas’, I got down to preparing them at home. This is the first time I ventured out to prepare home style ‘Rasmalai’. One of the greatest culinary creations that has won the hearts of millions the world over. My humble Pranam (salutation) to the makers of these divine specialties! 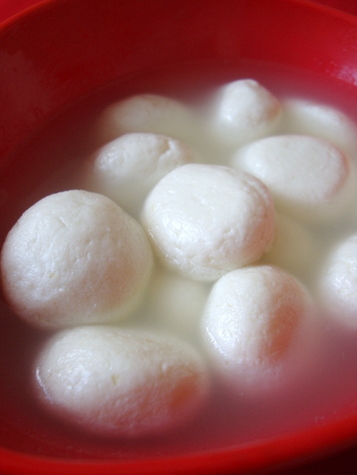 Rasgulla and Rasmalai are milk based desserts prepared with freshly prepared chenna aka cottage cheese balls. For Rasagulla, the chenna balls are cooked in sugar syrup till they double in size and are ready to be served. For Rasmalai, chenna balls that have been cooked in sugar syrup are gently squeezed off the sugar syrup and further immersed in saffron flavored sweetened thick milk to cook till soft. One of the most elegant Indian dessert delicacy with sweet and fragrant flavors! 1 Take a heavy bottomed vessel and boil milk. Once its boiled, slowly add the lemon juice and you will find that the milk will curdle and the whey will separate. The whey will become clear which is an indication that the milk has curdled completely. Immediately add about 10-12 ice cubes and turn off flame. Leave aside for 3-4 mts. 2 Strain the whey and add the chenna to a damp cheese cloth or a light cotton cloth. Gather the four corners of the cloth and twist it gently and rinse under cold water to remove the sourness of the lemon juice. Tie the ends and hang it at a height and allow the whey from the chenna to drain completely. Leave aside for 30 mts. 3 Remove the chenna onto a wide plate. Now knead it gently for 7 mts till there is no trace of moisture and is absolutely soft on touch. This is a very crucial step in the process of rasgulla making. 4 While you are kneading the chenna, prepare the sugar syrup. Place a pressure cooker on the stove and add water and sugar and allow the sugar to dissolve. Bring it to a rolling boil. Add a pinch of cardamom pwd. 5 While the sugar syrup is cooking, make small smooth balls of the kneaded chenna. Ensure there are no cracks on the balls. Slowly add the chenna balls to the boiling sugar syrup. Place lid and pressure cook upto 1 whistle and continue to cook for another 4 mts. 6 Turn off heat. Once the pressure is off, remove the lid. The balls will double in size and become light and springy on touch. If you feel that the balls are not cooked yet, place lid and cook for another 5 mts without the whistle at medium heat. 7 Remove onto a serving dish, bring to room temp, refrigerate and serve chilled along with sugar syrup at room temp OR proceed to prepare rasmalai. 1 Take a heavy bottomed vessel and add milk. Bring to a boil. Reduce to medium flame and go on stirring on a constant basis for a good 30 mts. 2 Add the sugar syrup and continue to cook for another 20 mts. Add the cardamom pwd, pistachios and saffron and combine. Boil for another 5 mts. 3 While the milk-sugar mixture is boiling, work on the rasagullas. Gently squeeze the rasgullas with a flat ladle such that it forms a patty shape and the syrup is drained out. 4 Add the flattened rasgullas into the thickened milk and cook on low flame for 5 mts. They will absorb the sweet syrup and Rasmalai is ready. Turn off heat and cool. 5 Refrigerate and serve chilled. Wow !!!! Looks superb, I am gonna try one of these today…. Mouth watering !! YUM YUM. Wow, I am drooling. Both the rasgulla and rasmalai look like one from Delhi Sweet shop. Thanks for posting these amazing recipes! I’m an ardent fan of your culinary skills, creativity & writing style. Kudos to you! Thank you so much for these wonderful recipes, I enjoy cooking very much and your website helps me a lot in improving it! Thanks for these wonderful recipes. Nehal is sooo lucky to have a mom like you. 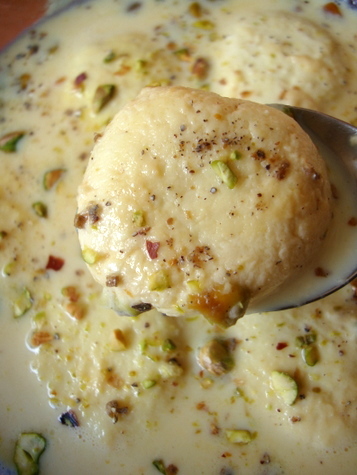 This is also a favorite desert for me, rasmalai looks yummy. Yum! I love rasmalai. I’ve made it several times with recipes very similar to this one, but they always come out too soft; almost to the point of falling apart. What are the reasons they would come out so soft? When I buy them from a restaurant, they’re very firm, sometimes too firm. I’ve tried draining the chenna longer, kneading longer, not allowing them to cook in the hot milk, only letting them heat through, etc. Nothing seems to work. I would love to hear your suggestions. Michelle, let the chenna pattis rest for a while before dropping into the thickened hot milk. Do not crowd the vessel with too many chenna pattis while cooking in the hot milk. You can also try this method ~ Once the thickened milk is almost cooked, turn of heat and place the chenna pattis and leave them for a while to absorb the milk. If you feel they need to be cooked for a while, turn on the heat and allow them to cook for 1-2 mts on low flame. Thanks for your Rasmalai and Rasagulla!!! I am a little confused with why is ice added to the milk. Also, once we strain the whey (as mentioned after 3 – 4 min), will it also contain ice pieces which might make the cheese moist? Please advice. 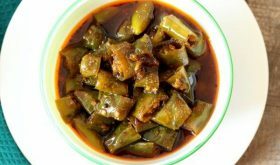 The high heat will make the chenna tough and to stop further cooking of the chenna ice is ,added to lower the temp, yielding a soft chenna. There will not be any ice left in the chenna. Wait till the ice melts completely and then strain. Rasmalai and Rasgulla are absolutely one of my fav desserts! Excellent Sailaja. Hearty congratulations. Wonderfully made and presented. Am sure Nehal musta enjoyed thoroughly. I never made rasmalai. But made rasgullas. The way my aunt, who is a traditional cook taught me is to whip the chenna with a tbsp of sooji ( that ll hold the chenna well) and the rest is the same. Pressure cooking is a nice idea. My favorite sweet! This looks amazing, I can’t wait to try the recipe! Thanks so much for posting! à°µà°¾à°µà±! à°°à°¸à°—à±à°²à±à°²à°¾à°•à°‚à°Ÿà±‡ à°¨à°¾à°•à± à°°à°¸à°®à°²à±ˆ à°…à°‚à°Ÿà±‡ à°šà°¾à°²à°¾ à°‡à°·à±à°Ÿà°‚. à°šà°¿à°²à±à°¡à± à°à°¤à±‡ à°‡à°‚à°•à°¾ à°¬à°¾à°µà±à°‚à°Ÿà±à°‚à°¦à°¿. à°§à°¾à°‚à°•à±à°¸à± à°¶à±ˆà°²à°œ..
looks lovely! Will try soon…..Thanks so much for all the recipes. I live in Dublin Ireland and I love all the recipes posted by you…been a great fan of your website for few years now!! P.S can cottage cheese from supermarket be used? Well, I have never tried with store bought paneer. You could try though. But kneading is an extremely important process to achieve the perfect rasgullas. They look stunning. I’ve always wanted to try this desert. Maybe it’s time I make it myself! ohh my god!! such yummy dessert..these are killers..yum yum yum..cant stop…love the clicks and the detailed presentation..tooo good..awesome..I am drooling over the clicks. Thanks. Pics look great as always. Yes, you can use canned (Swad) rasgullas too, Lakshmi. while i do appreciate that rasgullas and ras malai will taste heavenly if made in the steps mentioned by you.. but was just wondering if we replace following ready made items to save some time….!! 1. use canned rasgullas ( they are a bit hard) compared to homemade fresh ones. but thought, when we cook it in milk, it might become soft again. 3. Use everest milk masala. what are your thoughts if we substitute these things and proceed with your instructions where applicable??? just thinking aloud…. 1. Yes, you can use canned Rasgullas. 2. Yes, you can use evaporated milk. If the milk is too thick, you can add a little milk and bring to a boil. Reduce to simmer, add 3-4 tbsps sugar and allow to dissolve. Follow rest of the procedure. In case you feel the rasgullas might break. Turn off heat, allow to cool for a while, add the rasgullas and leave aside for an hour or so. 3. Am not sure about Everest Milk Masala. If you do not have saffron at home, use cardamom pwd and sliced almonds or pistachios. Rasmalai prepared from the steps mentioned above will taste equally good. Hope this helps, Jyothi. Have been going through your excellent site with clear and nicely presented recipes and great pictures for some time now. Just wanted to say thanks for all the lovely recipes! I add lemon juice to cold milk and then start heating milk. This results in soft chenna. If you add lemon juice to boiling milk then you get hard Chenna. If you are making paneer Tikkas then Lemon juice should be added to boiling milk. Its mentioned in the recipe. Either 12 large or 15 small rasgullas. Oh! wow!!!! I was late here…. But better late than never…. What do I say now????? No words only gazes at those yum looking delicacies…. Loved all of it…. Well prepared & presented & captured, to bring out the truth of these delightful delicacies….. 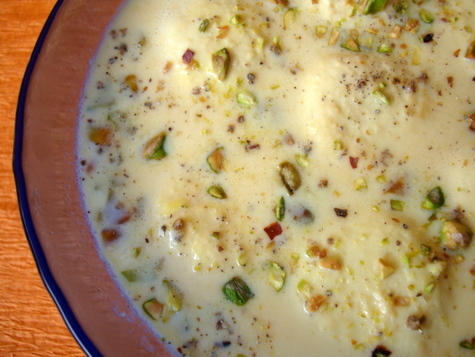 I love the rasmalai…. I’m craving to taste one right away….. GOD BLESS u for all those delights….. Thanks heaps Shailu, you are a darling…!!! i feel much more brave to try it in the shorter method and gain confidence to try the traditional method when i have more time in hand.. i really appreciate your effort and time for me…hugs….Jyoti. I tried rasagulla today and it turned out very nice. I added lit bit of nutmeg powder also. It is tasting wonders. My elder daughter loves rasmalai. So next time I will make rasmalai also. I bet that will also turn out well if I follow your recipe step by step. I wish I could attach the photo to show you how my rasagullas have turned out. Hope you remember me. I am Haripriya who wrote to you about your recepies published in the news paper. Thanks for your Rasagulla and Rasamallai recepies. I die for those Bengali sweets and waiting for these recipies in your blog from a very long time. I have these recepies from other sources, but what all I try from your blog always turn out so perfect. I need not have any worry or doubt. I can confidently serve them. Thank you once again. We stay in Bangalore and we get only cows milk here, can I get the same with cows milk also? Please suggest me if any alternatives required. Yes, I remember you, Hari Priya. Yes, you can use Cow’s milk. Can i use readymade paneer and how many grams to make 12-15 rasgullas. in step 5 it is mentioned to cook for another 4 mts after one whistle but not mentioned if it is to be cooked on low flame. plz clarify this doubt. Paneer prepared from 1 lt milk will yield 12 large rasgullas. It could approx be 250 gms of fresh chenna. 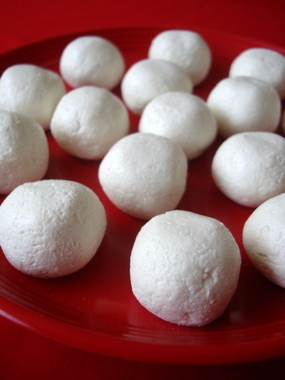 You have to use fresh paneer (chenna) to prepare Rasagullas. Reduce flame to low to medium flame and cook for 4 mts. Hope this helps. I tried this recipe this weekend. Rasgulla and Rasmalai came out awesome, if I may say so myself :). I have not tasted that soft Rasmalai after coming to US. Reminded me of India. Thank you sooooo much Sailu for such a detailed and amazing recipe (Hugs). Will definitely prepare them again next weekend. Thanks for posting the recipe. I tried it last weekend, the steps till kneading the chenna came out well. Bu when I cooked the balls in sugar syrup, they were not soft. Hence the rasmalai did not come out soft as well. Do we have to immerse the balls completely in sugar syrup for it cook evenly? If not using pressure cooker, how long can we cook the rasgullas for it to become soft? Pls let me know what went wrong! The balls can be partially immersed, Naz. Follow this rasgulla recipe to cook over stove top. I tried this recipe yesterday and it was a grand success. I loved those rasgullas. The only thing I felt was it needed a little more sugar/sweetness. May be 1.25 cups of sugar might have been a good sweet for us. I never imagined me making Rasgullas nor I thought it would be as easy as this. Thanks for the Recipe Sailu..
hi sailu, my doubt is which would you prefer for this recipe cow’s milk or packet milk? Packet milk is also cow’s milk, Divya. You can use packet milk. I die for these Bengali sweets. I tried rasagullas yesterday and it was a grand success. Rasgullas turned very delicious. I tried these rasgullas they came out really really good. thanq! iam regular visitor of ur blog. actually iam newly married so new to cooking. As iam in USA it is difficult for me to call my mom all the time so I keep looking at all the vegetarian dishes from ur blog.I tried most of them and every thing turned out really good. thanq! for ur dishes and i really appreciate some of ur simple yet delicious dishes. Thanks for the wonderful recipe. I used fat free milk to make rasgulls, the shape was intact when boiled but they did not double in size and also they tasted rubbery. Should we not use fat free milk for rasgullas? You can use fat free milk to prepare rasgullas. While preparing paneer, you need to cook the milk in vinegar/lemon juice on low flame for just few mts. If you cook on high heat, you will get a rubbery textured rasgulla. This website was introduced to me by my husband a couple of years ago and from then on I am an ardent follower of it! Wish you a Happy Varalakshmi vratham. yesterday i tried rasgulla and i made it perfect,this because of u THANK U very much for this delicious recipe. I made the rasgulla following ur recipe for Diwali and it turned out to be a super hit. I tried ur rasgulla recipe and it turned out so well. The only thing I felt was the lime flavour was a bit dominating….I washed it twice, but still the smell of lime was there in the rasgullas…Can you give suggestions pls? I don’t have a pressure cooker. How do I make the rasgullas without one? Many thanks for this recipe…Have made it quite a few times and have had rave reviews. I tried your gulab jamoon recipe recently and they turned out to be amazing melt-in-the-mouth goodies! Thank you very much for your recipes which are always spot on! i did exactely the same, and they look awesome when they were hot, as soon as it became cold.. they became hard.. please let me know any alternative for this. I prepared rasgullas today they came out very well. I tried out Rasgulla recipe. i got the paneer from full cream milk. But my rasgullas dint double in their size after I cooked them in sugar syrup in a pressure cooker.They have a rubbery texture and are not soft. Can you please let me know what went wrong? 1) Quality of your Chhena. If your chhena is Hard then the rasgulla will be hard & its volume will not increase after boiling. If you keep long time the Chhena balls before dropping to sugar syrup, the outer surface of the chhena ball will be Hard.So the volume will not increase after boiling. Prepare Chhena when the temperature of milk is nearly 70 to 80 degree centegrade (after boiling). After separating the Chhena with a cloth,put it in to cold water. Add a pinch of backing powder to the chhena along with very few amount of flour. 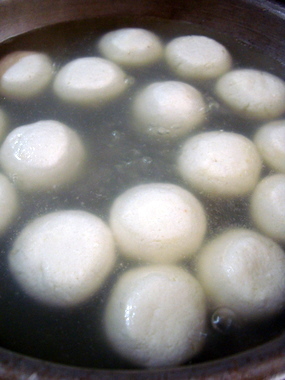 Boil the Chhena balls in two stages. First boil in thin sugar syrup. After boiling properly add these in to thick syrup. I would like to ask about what kind of milk is good for rasgulla. Whenver i tried to drain out the whey from chenna,somehow chenna also drains out. I use cotton cloth. Is it because the milk has lower fat content or smth. Is it you shouldn’t boil milk for too long. Anybody got any idea. You can use cow’s milk, bring to a boil and you need not boil for a long time. You need to use a cheese cloth with very tiny pores. I made Rasmalais as you had suggested but I used a vessel to boil the Rasmalais in the sugar syrup (1 and 1/4 cup of sugar and cardamom powder) as I dont have a pressure cooker (bachelor home problems :P). When I boiled the rasmalais in the sugar syrup (bubbling hot) the rasmalais had doubled their size post 5 mins and then kept it a side for it to cool while squeezing off the water as told. Then I had put them into the reduced milk (and kept it like an hour (off flame). My problem was Rasmalais were not sweet at all. But ate all of them with the help of the reduced milk sweetness. Can you please let know what might have gone wrong in my preparation. thanks ? doubts not in double in size & become light &spring in touch &1” creaks on outer surface on rasgolla & rasmallai ? ? As I placed the balls of chenna in the boiling sugar syrup in Fisslers pressure cooker , they broke ..what should I do…last time I made them they were excellent this time I do not know what went wrong..but the chena was from the naturally split milk. Reduce flame after first whistle. Hello, can i use youghrt cheese instead of chenna.plz suggest ? ?if no den plz give me any desert recepie of youghrt cheese. I tried the rasgullas recipe……it went so fine. It was so delicious and mouthwatering to eat. Thanks for posting such a nice recipe. Can I use lime instead of lemon ?? How to remove lemon smell from rasgulla after it is already been prepared??? Wash the fresh paneer in water thoroughly before kneading it.